Dr. David Biberdorf is a partner with Valley Vision Clinic in Grand Forks, North Dakota and the director of Valley Sports Vision. A graduate of the Southern California College of Optometry, a Fellow of the College of Optometry in Vision Development and a member of the Neuro-Optometric Rehabilitation Association, Dr. Biberdorf specializes in vision therapy of amblyopia, strabismus, and non-strabismic binocular vision disorders. He is an adjunct professor with the University of North Dakota’s Dept. of Psychology and has published research in the area of visual attention, athletic performance and concussion. His practice also serves as an optometric student extern site affiliated with the Michigan College of Optometry. 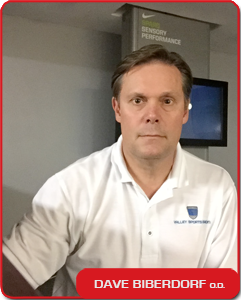 Among Dr. Biberdorf’s ongoing research interests include the investigation of vision and athlete performance, assessing the visual sequelae of head injuries and the rehabilitation/enhancement of athlete visual skills. As a spectator at the 2014 Winter Olympics in Sochi, Dr. Biberdorf was able to watch seven of his former patients participate in international hockey competition.